Swiss luxury watch brand RJ-Romain Jerome joins forces with Warner Bros. Consumer Products, on behalf of DC Entertainment, to celebrate the 75th Anniversary of DC Comics’ Batman. Introducing a new legend to its Collaborations collection, RJ-Romain Jerome pays tribute to Gotham City’s Super Hero with a timepiece inspired by the Dark Knight: the Batman-DNA. Inspired by Batman’s heroic personality, the aesthetics of the timepiece are an acknowledgment to the fantastic world that has been built around his character. Housed in a 46 mm black PVD-coated steel case, the black bezel has been machine-worked to showcase the bold and singular facets, recalling the angular contours of the “Batmobile.” The dial of the Batman-DNA mirrors the Gotham City Super Hero’s personality – raw, yet sophisticated. An eye-catching Batman emblem applique, lacquered in black, is placed at the center of the dial. The legendary “Bat-Signal”, shines at night thanks to an engraving, filled with black Superluminova, which outlines the hero’s famous symbol. The rest of the dial has undergone RJ-Romain Jerome’s special “rough” finish, giving the watch a dark and edgy look. The RJ logo applique is placed at 12 o’clock, allowing each detail of the dial to stand out and amaze the wearer each time he looks at the watch. A black Hornback crocodile strap has also been added to the timepiece, resembling Batman’s avant-garde leather gear. 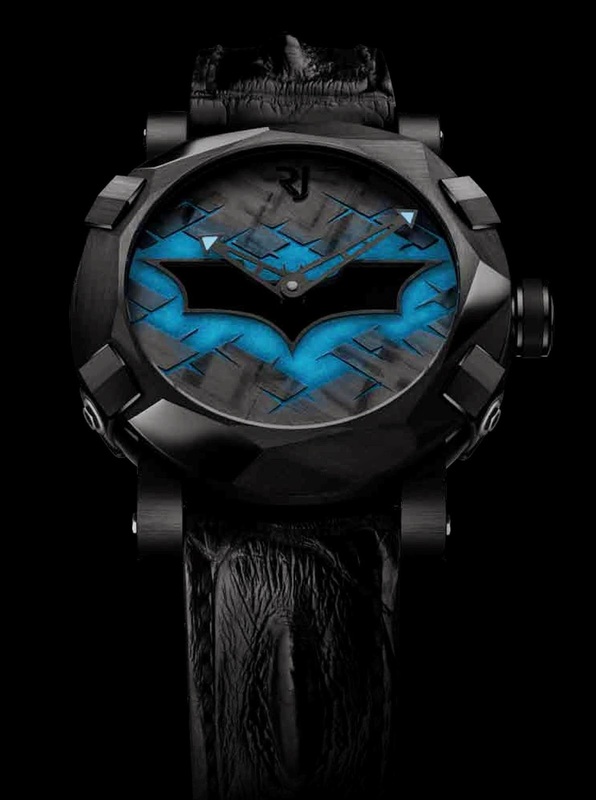 Additionally, an engraving of the Batman emblem can be found on the back of each watch, placed on a “rough” finished medallion, accentuating the darkness of the timepiece. Limited to 75 pieces, the Batman-DNA celebrates the Dark Knight’s 75th anniversary.